I’m so happy to be sharing my new Una dress with you today. I recently wrote about the trunk show I attended with friends at Velouria. I might have mentioned that I bought an aubergine skirt that evening. Well, I also bought this dress. And while it wasn’t exactly made with me in mind, it fits like it was. And it is hand-crafted by Una’s owner, Susan. It was meant to be. I had a few items by other brands picked out but when I tried this on, there was no contest. It’s so soft and stretchy. And it’s lined (a rare thing to find in a cotton jersey knit dress). I just love the eyelet detailing on the shoulders. 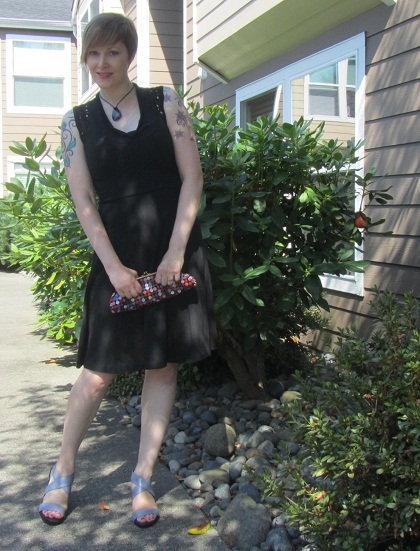 I went the unexpected route by wearing periwinkle shoes, an amethyst pendant, and a button-covered vintage clutch. I’d wear this dress to work, shopping, or a fancy gathering (it can be dressed up or down). Today, however, I wore it to dinner with the Mister.